Congratulations to ThemePunch, who have reached Power Elite status by making one million dollars worth of sales. This team is the perfect example of a collaboration that works—three Envato authors decided to combine their efforts over a German beer. In August 2011, Krisztian and Dirk (both from “FlashHorvath”) and Moritz from “Damojo” had a casual Envato author meetup at a pub in Cologne. Ideas were shared, beers were drunk, and after a short while we had an idea! Three years later the team has grown and they’re going stronger than ever! Though they’re dedicated to their work, they also place great focus on health, life and family, and work hard at maintaining balance. That sounds like a recipe for continued success for years to come. Congratulations! We asked the team a few questions about the journey to the $1,000,000 milestone. Read on to discover how they set up their workspace for effective communication, their huge success with Slider Revolution, and how it feels to reach a million dollars worth of sales! Happy Power Elite Day ThemePunch! Wow!! Did we really just sell $1 million worth of stock products? You can’t see us but we are totally doing a happy dance now! Feels like it was yesterday that we uploaded our first item to the Envato Marketplaces. Two years later, so much has changed for us—it’s needless to say we are very excited about this big step. Thanks to our faithful buyers and envato who made this great achievement possible in the first place! Tell us a bit about your design space, where you live, work and dream! Our core team works from an offce in the heart of Cologne, Germany, with everyone also living close by. Getting to the office quickly means more time to do work, and more time to spend with our families! We like to keep a private and friendly atmosphere, so we all sit together in the center of our office, facing each other. As we are constantly communicating, not working from separate locations greatly helps us to coordinate our efforts. Apart from working, we believe in a healthy work/life balance at the office. This includes cooking fresh food (almost) every day, working out at our exercise machine, sometimes doing yoga, and of course fooling around with our co-workers. How did your journey with us start? With Krisztian being a front-end developer, Dirk a back-end coder and Moritz more design focused, we decided to put our combined powers to good use, and founded “ThemePunch” at the end of 2011. And what a ride it has been! What started out as a small additional income on the side soon became our main focus, and allowed us to quit our regular jobs and start a company. In 2013 we introduced a fourth member to our core team. We are happy to have Patrick with us, who is a specialized back-end developer for our CodeCanyon products Slider Revolution, Essential Grid and ShowBiz Pro. Great to have a CodeCanyon/ThemeForest author join the ranks. Were you surprised by the runaway success of Slider Revolution? We started off with Slider Revolution together with Max, a developer from Israel who helped us with the back end. Our idea was to create a slider product that offers features that didn’t exist on the market yet. In the beginning, the sales were bumpy to say the least! We soon discovered that a Marketplace item, in order to really succeed, needs constant improvement in all aspects (features, presentation, support). After putting more and more work into Slider Revolution, sales started to pick up, and we were very happy to see that people are enjoying our product! After almost two years, Slider Revolution is not the same product it was before. 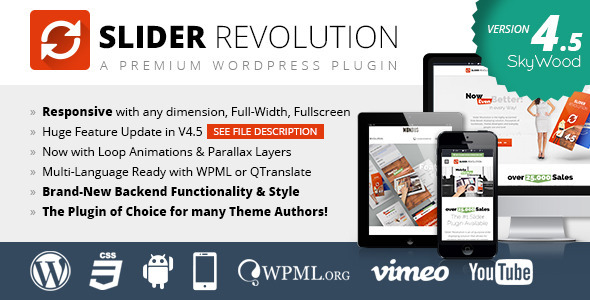 With 4.5 being the current version and 5.0 in the making, we have revised, improved and overhauled Slider Revolution to become a solid, mature product. How did you get into Developing and Designing? We were pretty much all working at traditional IT/web companies when we discovered the Envato Marketplace. Krisztian was working as a solutions manager at a Cologne-based company, together with Dirk. Moritz was employed at a web design agency in düsseldorf, making a living as a designer. We did not jump into self-employed work head over heels. Instead, we tried to make some money on the side until it was enough to take the big step and quit our jobs! We can honestly say that working on the Envato Marketplace has helped us to improve our programming and design skills a lot, maybe even more than working for a traditional employer. When creating items for the Marketplace with the aim to make a living, you must produce cutting-edge work in all aspects. Producing items for the Envato Marketplace has helped us become more professional in our work fields every day. Any hot tips for authors starting out? Take your time with items and don’t rush anything. Good quality code matters a lot in the long run, as it will facilitate updates and improvements by yourself and the buyers alike. Listen to your customers! Designing a perfect product from your point-of-view doesn’t necessarily mean it’s fit for everyday situations that some buyers use it in. We’ve already incorporated lots of customer-inspired ideas into our products. In general, be persistent! You cannot expect to hit the jackpot with the first item you release. This can happen, but very rarely. What is the next big thing for ThemePunch? Our goal is to continue to broaden our product palette to ultimately have a “must-have” selection of essential plugins that facilitate website and theme building! We are constantly optimizing how our plugins are working with each other by introducing shared libraries. We want everything to be build in a modular way, so customers can chose what they need and only load the bells and whistles in their websites if they really need the features. Also, with having such a strong plugin base, we are preparing to push our presence on ThemeForest by releasing more great themes on our “Damojo” account. Unwinding may be a difficult task in times of great stress, but that’s also the time when it’s most important to regain energy and focus. All of us try to exercise 3-4 times a week, by either working out or going for a run. Spending time with our families also helps to get the mind away from work for a while. We would like to say thanks to all our buyers, and Envato, who made reaching this big sales milestone possible in the first place. Over the last few years, we have grown as a company as well as personally. Making a living selling stock products has proven to be a great tool for self-fulfillment!